Courtesy photo This headgate, complete with a “cowcatcher,” controls water flow from the Big Wood River to 43 irrigators along Broadford Road between Hailey and Bellevue. The purchase of a large property along Broadford Road south of Hailey can include surface water rights necessary for irrigation. These rights allow property owners to draw water from the Big Wood River through canals. Yet these irrigation rights can also come along with shared responsibilities to maintain the canals, some of which were built nearly 100 years ago. 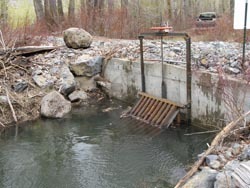 District Court Judge Robert Elgee ruled on Feb. 28 that Marc Richards, the sole member and managing member of Big Wood Ranch, must pay $9,500 in dues to the Water Users’ Association of the Broadford Slough and Rockwell Bypass Lateral Ditches Inc. The association was formed in 2002 by a collective of 43 water users irrigating from two interconnected canals drawing water from the Big Wood River. Richards became a de facto member of the association when he bought the 100-acre Big Wood Ranch on Broadford Road from magazine publisher Jann Wenner in 2006. In the process, he also, perhaps unwittingly, agreed to pay annual assessments of about $1,500 to cover the cost of removing debris, beaver dams and silt from the canals, and perform regular maintenance on canal headgates, which allow water to flow from the river. “Without such maintenance activities … the surface rights of such water rights holder would be incapable of being delivered,” Elgee wrote in the case’s findings of fact and conclusions of law. Richards unsuccessfully challenged the association’s right to organize and operate under Idaho law, and its authority to charge him annual fees for his participation in the water delivery system. The Broadford Slough meanders through private property from a headgate at the Big Wood River about 100 yards upstream from the south side of the Star Bridge south of Hailey, for about two miles to where it rejoins the Big Wood River just west of downtown Bellevue. “It was originally a flood channel or seeping area on the west side of the river,” said Wood River Basin Watermaster Kevin Lakey. The Broadford Slough was refined into an irrigation ditch with help from the U.S. Army Corps of Engineers in 1960, said the association’s Twin Falls-based attorney, Gary Slette. “As a result of saving some of the flow of water that might otherwise have been lost, certain water right holders acquired surface water rights from construction of the Rockwell Bypass by virtue of the Rockwell v. Coffin Decree [which established the water right by the state],” Elgee wrote. Slette said the association had sustained $70,000 in legal fees since Richards first protested the assessments in 2010. Slette said he is hopeful that the court will order Richards to reimburse the association for those fees. “But I am never sure this will happen until I see the court order,” he said.